A generous grant will help free clinics staffed by the College of Medicine, College of Nursing, physical therapy and social work programs serve 400-500 patients each year. A grant will fund equipment, supplies, technology and faculty leadership for free clinics staffed by UCF personnel that serve Apopka farmworkers. For hundreds of Apopka farmworkers living in poverty, receiving regular, quality healthcare is an endless challenge. But thanks to an interdisciplinary effort from the University of Central Florida’s Comprehensive Medical Care Outreach Team (CMOT) and a generous grant from the Florida Blue Foundation, the challenge will be a little less daunting. The $395,000 award is the Florida Blue Foundation’s 2018-2019 Advance Innovation and Promote Solutions in the Health Care System grant and will fund equipment, supplies, technology and faculty leadership for free clinics that serve the farmworkers. 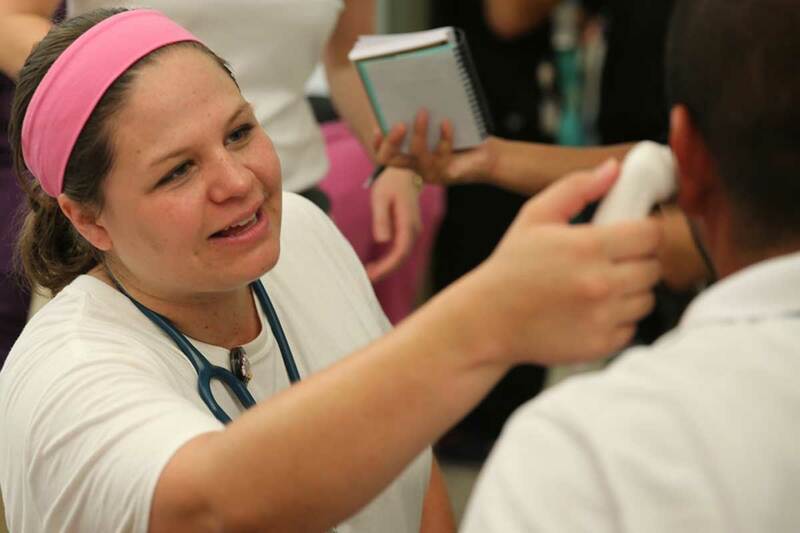 Held quarterly since 2016, the clinics are staffed by volunteer students and faculty from UCF’s College of Medicine, College of Nursing, physical therapy and social work programs as well as the University of Florida’s pharmacy school. The goal is to reduce the number of people who do not have access to healthcare because of poverty, lack of transportation, language barriers and fear of bias due to immigration status. The self-proclaimed “indoor foliage capital of the world,” Apopka is home to many farmworkers who work in the greenhouses and fields that grow the houseplants and ornamentals that decorate homes, landscaping and offices around the country. “For the people who live in this community who might have a problem with transportation, who might have a problem getting appointments set, this is an amazing opportunity for them to get served and even get referrals for long-term care,” says Jeannie Economos of Farmworkers Association of Florida where the clinics are held. In the Apopka farmworker community, the leading causes of death are heart disease, cancer and stroke. The clinics serve 400-500 patients each year and target hypertension, nutrition, cholesterol and obesity, factors that directly impact those causes. Judy Simms-Cendan, professor of obstetrics and gynecology and co-organizer of the farmworker clinics, recognizes that the effort also good for UCF’s students. “The clinics are a great teaching opportunity and a really rich environment to learn in for all the students involved,” she says. A key component of the clinics is that faculty and students from many disciplines work together to provide a collaborative approach to care. Nursing, medicine and social work students work in teams to check blood pressures, help diagnose ailments, and talk to families about domestic violence, child-rearing and housing issues. Pharmacy students help patients find the most affordable prescriptions and physical therapy students and faculty provide treatments for work-related injuries. This inter-professional learning develops enhanced teamwork skills that will apply in the real world of care. Although the live clinics provide crucial opportunities for the farmworkers to receive care, the CMOT is working to leverage technology to provide access to specialists who are not regular clinic participants and to continuity of care between clinic sessions. Funds from the Florida Blue Foundation grant will be used for computers capable of compliance with federal medical privacy laws that will be used at the Farmworkers Association’s office to connect patients via video link with specialists in areas such as endocrinology, dermatology and neurology. As an example, many farmworkers suffer lesions from exposure to pesticides and the sun. Through telemedicine, a dermatologist could see the lesions and take images for diagnosis. The CMOT will also develop a telemedicine app that can help patients track their medicines and receive text reminders about upcoming doses and refills. Despite their poverty, many of the farmworkers have inexpensive mobile phones that become their lifeline to family and the Internet and are capable of receiving text messages. The Apopka farmworker outreach is just one example of the kind of interdisciplinary collaboration envisioned with the development of UCF’s new Academic Health Sciences Center at Lake Nona, which brings together all of the university’s health-related academic, clinical and research programs to deliver a comprehensive approach to patient care. The Florida Blue Foundation enables healthy communities by making grants, building coalitions and rewarding best practices. Florida Blue and the Florida Blue Foundation have generously supported a wide range of UCF initiatives for more than 15 years, with their cumulative giving totaling more than $1 million.